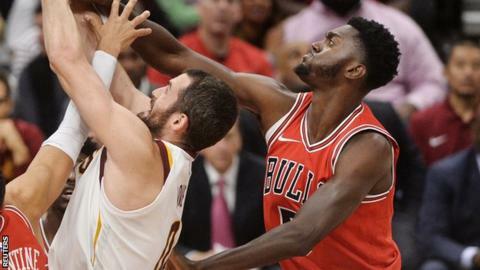 Chicago Bulls forward Bobby Portis has been suspended for eight games for breaking team-mate Nikola Mirotic's jaw when he punched him during practice. Spaniard Mirotic, 26, will miss four to six weeks after suffering upper jaw fractures and a concussion during Tuesday's altercation. "Both players were involved but only one player threw a punch," said Bulls vice-president John Paxson. "Portis is a good kid, but in this instance, he made a mistake." Chicago's first game of the new NBA season is against Toronto Raptors on Thursday.